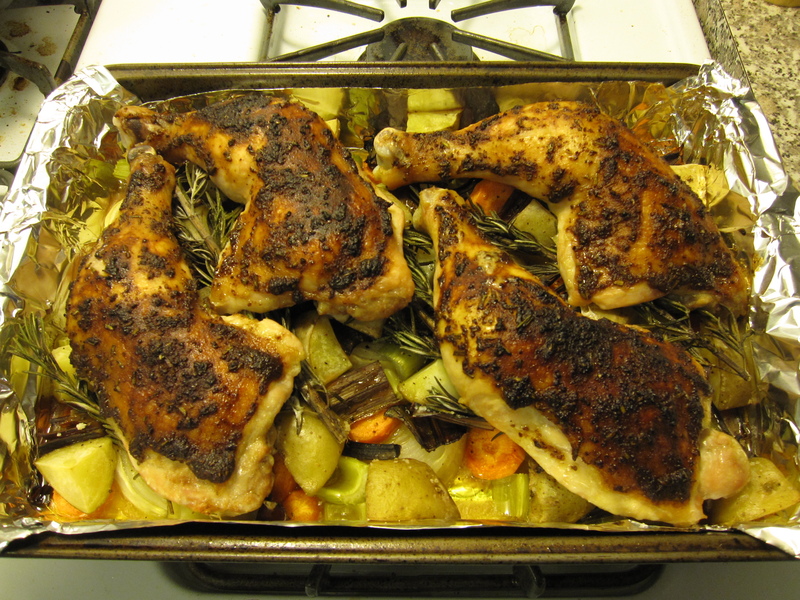 Roasting chicken on top of vegetables is one of the easiest ways to prepare a healthy, well balanced meal. 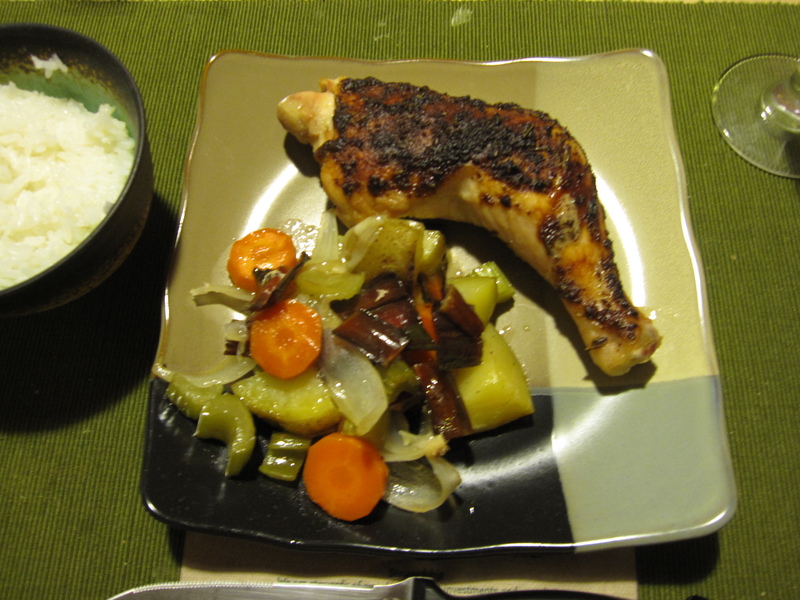 You can add whatever veggies you want, season or marinade the chicken with just about anything, and there’s few dishes to clean since everything is roasted in the same pan. Last night I marinated some whole leg parts in a sauce that consisted of a couple spoonfuls of mustard (any kind of mustard works, my favorite is Boetje’s, a Dutch stone-ground style), a few tablespoons of soy sauce, some chopped garlic, some finely chopped fresh rosemary, black pepper, and a couple tablespoons of olive oil. Mix that all together and then coat the chicken skin with it. For the veggies I chopped up three stalks of celery, one carrot, three yukon gold potatoes, one onion, and the leftover chard stems from the Ethiopian stewed chard that I made a few nights ago. I threw them all into my roasting pan and tossed them with olive oil, salt, and pepper. 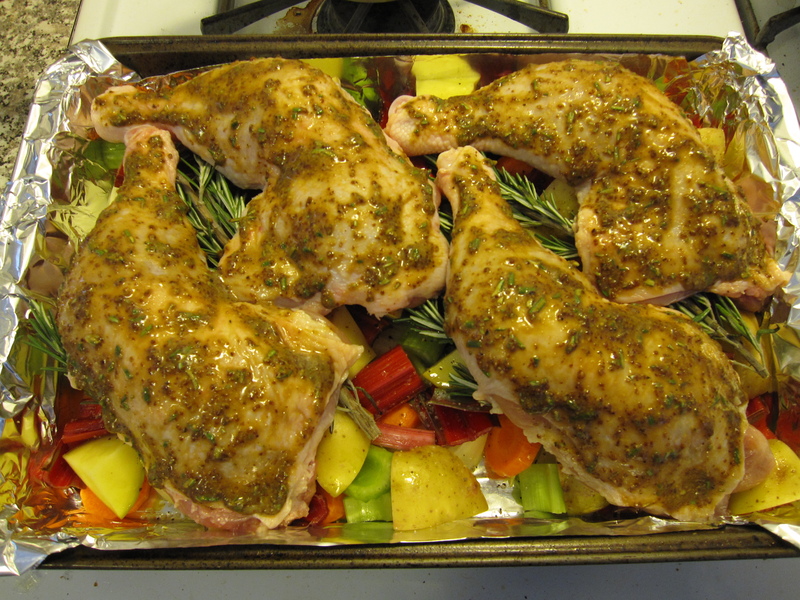 On top of the veggies I layed down some rosemary sprigs and then the chicken. I let it all roast in a 375 degree oven for about an hour and 15 minutes, or until the skin was nice and crisp with the meat cooked and juicy. 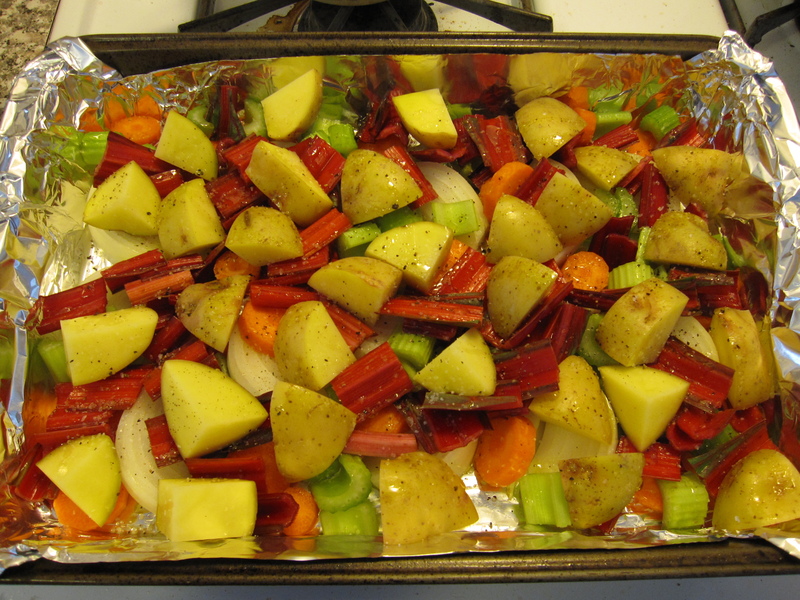 My favorite thing about roasting chicken on top of veggies is that the chicken fat that cooks off helps cook the veggies. So you’re basically cooking with chicken fat. It’s not at all unhealthy either as I leave most of the juice in the pan when I serve. Only a little of the chicken fat makes its way into my belly. As we know, a little chicken fat never hurt anyone.